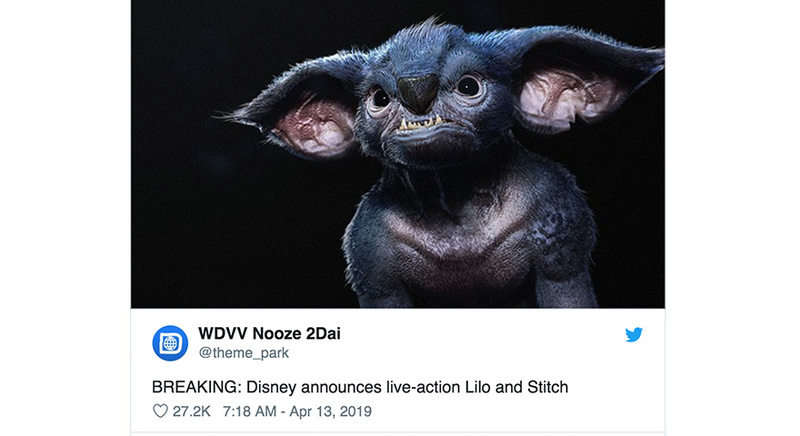 Live action Lilo & Stitch memes are going viral in response to a tweet that claimed to show what Stitch will look like. The 2002 Disney film Lilo & Stitch is about a young Hawaiian girl who befriends a genetically modified alien who wreaks havoc wherever he goes. Although Stitch is supposed to be an ugly alien, he is ultimately sympathetic to audiences and many of us find the cartoon version to be downright cute. Following a larger trend of live-action remakes of Disney classics, in 2018 the studio announced plans to make a live-action version of Lilo & Stitch. In spite of the serious tone of these tweets it appears that this post was indeed a hoax and fake news. In a third Tweet, WDVVNT credited artist Boris Kiselicki for creating the image. Whether or not they’re aware that the image didn’t actually come from Disney, many people have been expressing their horror at the unveiling of the image. Those who are exhausted by Disney’s sometimes uncanny live-action remakes jumped in to mock the scary-looking Stitch. What Disney’s “live action” version of Stitch will actually look like remains to be seen. Many of these memes use references from the film to drag the image for being so creepy.